Osbourne, 70, will remain under doctor's care in L.A as he "recovers from an injury sustained while dealing with pneumonia." It's the latest in a serious of health issues for the rocker, who - according to his wife Sharon - stopped breathing and his heart stopped beating after a quad bike accident in 2003. In a statement on Facebook, Osbourne said: "I can't believe I have to reschedule more tour dates. He added: "I'm grateful for the love and support I'm getting from my family, my band, friends and fans, it's really what's keeping me going. "Just know that I am getting better every day… I will fully recover… I will finish my tour…I will be back!" 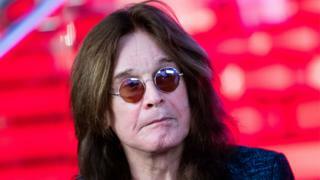 His last gig was a set at his own Ozzfest in California on New Year's Eve 2018.